Listing your home for sale between May 1 to May 15 may help it sell faster during what is shaping up to be a competitive spring buying season. But could the color of your walls cause your house to remain on the market for longer? Yes, says Kim Burns, owner of Five Star Painting in Fort Worth, Texas. For potential buyers, outdated wallpaper or oddly colored walls can be a deterrent. 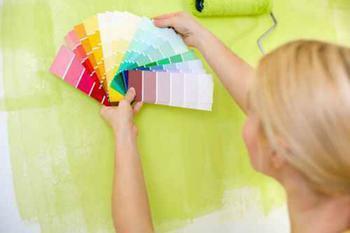 In fact, many realtors will recommend replacing wallpaper and applying a fresh coat of paint to make a home feel more modern and neutral. To help your home appeal to the widest range of buyers, it may be necessary to give your chevron-patterned wall the boot. So, which colors are most desirable to buyers? Neutral interior paint colors such as grays, whites, and beiges. For exterior paint, Burns recommends selecting an earthy hue. Wet it first with a water and fabric softener mixture. Apply the mixture on small patches of the wallpaper and make sure it’s completely soaked before scraping the wallpaper sections off with a putty knife. Apply the water and fabric softener mix repeatedly to make sure even the thin layer of wallpaper closest to the drywall is safely removed. This will ensure a new coat of paint can be applied without peeling. When painting over dark colors, consider applying a stain-blocking primer -- such as Sherwin Williams ProBlock or Kilz -- to the walls before painting. “This neutralizes the paint, so the old, dark color won’t show through after the new paint is applied,” says Burns.